Opera Mediaworks, the online advertising arm of software maker Opera, has released its State of Mobile advertising Q3 2013 report indicating that iOS devices still account for most mobile ad impressions, but that it’s primarily down to a strong performance by the iPad rather than dominance by iPhone. The company said that its ad network reaches 400 million consumers each month and that it serves around 60 billion ads in that same time frame. Of these (for the quarter) iOS devices accounted for 44 percent of mobile ad impressions and 50 percent of revenue. Removing iPads and Android tablets from the equation, however, reveals that iPhone and Android smartphones are closely tied for volume of impressions at 31 percent and 30.3 percent respectively. BlackBerry devices accounted for 2.84 percent of impressions, while Windows Phone scored just 0.36 percent of mobile traffic. The company also noted that the strong performance in terms of iPad and Android tablet sales means that these devices now account for 10 percent of the total mobile ad impression figures; a doubling from around 5 percent at the same time last year. Also included in the report are figures around smartphone and tablet version usage which revealed, somewhat surprisingly, that despite only being launched at the end of the quarter more than 61 percent of Apple devices are now running iOS 7. In contrast, Android Jelly Bean usage (the most recent version of the OS) is hovering just below the 50 percent mark, underlining the more diverse device usage and fragmentation problems associated with Google’s mobile OS. 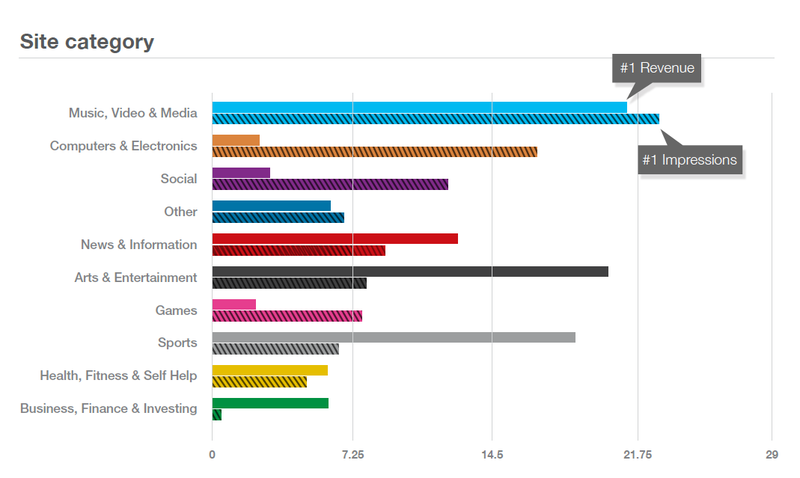 As well as looking at device usage, the report also looks at the type of content that drives the most impressions. On this front, the Music, Video and Media category is now “the consistent leader” in terms of impressions and overall monetization. Sports, which briefly rose to the top spot for monetization last quarter, is now back in third place. Overall, the Business, Finance and Investing category still produces the highest revenue per impression. This quarter, the report also looked into the sports category in a little more detail and found that even though traffic is highest at weekends, engagement is highest towards the end of the week. The explanation? Within the category there are multiple sub-divisions for each sport, and each has its own season game schedule. So, for example, while baseball and hockey games take place throughout the week, American football mostly takes place on weekends.